A team of scientists using data from the Kepler space telescope say they have identified a planet 22 light-years away that could possibly harbor life. Astronomers from the Carnegie Institution of Washington and the University of California, Santa Cruz say the planet resides in the habitable zone – placing it in a region where temperatures are neither too hot nor too cold for liquid water to exist on the surface of the planet. The star is a member of a triple star system and has a different makeup than our Sun, being relatively lacking in metallic elements. The discovery was announced yesterday, and was led by Guillem Anglada-Escudé and Paul Butler of the Carnegie Institution for Science. This discovery demonstrates that habitable planets could form in a greater variety of environments than previously believed. 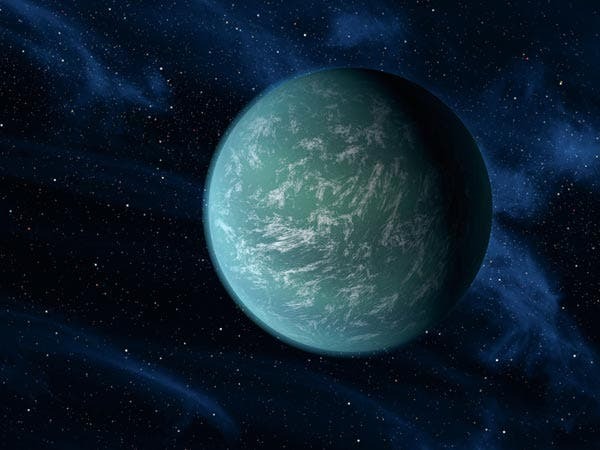 Researchers estimate that the planet, call GJ667Cc, is at least four times more massive than planet Earth. It takes roughly 28 days to orbit its nearest star. While the planet can not yet be seen directly, it is not impossible that the next generation of ground or space telescopes could take readings of its atmosphere to look for signs of life. The planet’s main star, a red dwarf, is relatively dim, so the planet receives slightly less light from its star than Earth does from the sun. But most of the star’s light is infrared, so the planet should absorb more of its incoming energy than Earth does from sunlight. That means if the planet has a rocky surface — which is predicted for planets less than ten times Earth’s mass — and an atmosphere, it could support liquid water and maybe life. “This planet is the new best candidate to support liquid water and, perhaps, life as we know it,” Anglada-Escudé said. The discovery has a number of astronomers considering the possible implications. The discovery comes just months after NASA’s Kepler telescope began its mission to discover various exoplanets. The telescope, which to date has discovered upwards of 2,000 planets, has identified a number of curious and interesting planets, including one so hot that it would melt lead. The team noted that the discovery likely means more Earth-like planets exist than previously thought. Their planet-finding technique involved measuring the small wobbles in a star’s orbit in response to a planet’s gravity. Anglada-Escudé and his team focused on an M-class dwarf star called GJ 667C, which is 22 light years away. It is a member of a triple-star system. The other two stars (GJ 667AB) are a pair of orange K dwarfs, with a concentration of heavy elements only 25% that of our Sun’s. Such elements are the building blocks of terrestrial planets so it was thought to be unusual for metal-depleted star systems to have an abundance of low mass planets. But in addition to this first candidate, the research team found the clear signal of a new planet (GJ 667Cc) with an orbital period of 28.15 days and a minimum mass of 4.5 times that of Earth. The new planet receives 90% of the light that Earth receives. However, because most of its incoming light is in the infrared, a higher percentage of this incoming energy should be absorbed by the planet. When both these effects are taken into account, the planet is expected to absorb about the same amount of energy from its star that the Earth absorbs from the Sun. This would allow surface temperatures similar to Earth and perhaps liquid water, but this extreme cannot be confirmed without further information on the planet's atmosphere. The discovery comes just weeks after NASA announced the discovery of hundreds of exoplanets, noting that some are likely to reside in the habitable zone. In December 2011, scientists announced the mission’s first confirmed planet in the habitable zone of a sun-like star: a planet 2.4 times the size of Earth. Later in the month, the team announced the discovery of the first Earth-size planets orbiting a sun-like star outside our solar system.